Oddly enough, for so prominent a golfer in his day (he won the Open Championship in 1891), the last time I looked at Wikipedia it had both the year of his birth and of his death incorrect. He was born in St Andrews in 1868, the youngest child of the family and younger brother of Andrew Kirkaldy. 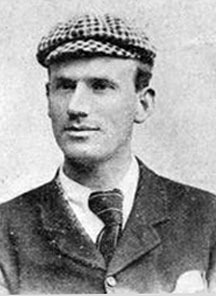 At 18 he won the professional tournament run with the autumn meeting of the R&A and, two years later, playing with Ben Sayers, he reduced Young Tom Morris’s record of 77 for the Old Course to 74 then lowered it by a further stroke the following year. The 1891 Open was the last played over 36 holes, in a single day, and, in terrible October weather, Hugh Kirkaldy’s two round score of 166 was the lowest in any of the 36 hole Opens at St Andrews. His brother, Andrew, was second, defeating Willie Fernie in a playoff. Hugh went south to be professional first at Oxford and then at the Silloth club but returned gravely ill to St Andrews in 1895. He died there in April 1897.